Coeur a la Creme. Literally, the heart of the cream. This is a beautiful, romantic dessert that I’ve been wanting to make my husband for a long time. Because of the heart-shaped mold it’s perfect for Valentine’s Day, but I didn’t want to wait that long! I’m not a baker (or a butcher or candlestick maker, though I’d love to be both), or much of a dessert maker, much to Mr. Pants chagrin. However, writing this blog has emboldened me, and I decided to finally gird my loins and prepare Coeur a la Creme. It was much easier than I thought it would be! Lining the mold with cheesecloth makes it easy to unmold later. Now, this recipe is a perfect introduction to the French term, mise en place. It’s the practice of setting out all your ingredients ahead of time, measured out when needed. In this case, I had a beautiful mise going on, save my heavy whipping cream, which I decided to leave refrigerated until the last minute. I had my softened mascarpone in the mixing bowl, my lemon juiced, and all my other little ingredients measured out and put into little bowls. I reached for the heavy whipping cream, only to find half-and-half. What.the.eff. Fastest Safeway trip ever. My mold is filled with my delicious mascarpone mixture! 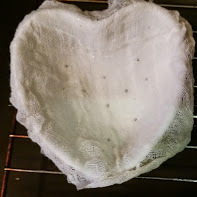 I only have two molds, so I put the remainder in a cheesecloth lined mesh colander. I wasn’t willing to commit to four molds until I’d tried the recipe once. They’re not at all expensive, about $4-8 depending where you find them, and of course I now wish I had bought all four at once. Oh well, the colander Coeur a la Creme wasn’t pretty, but it was still delicious! 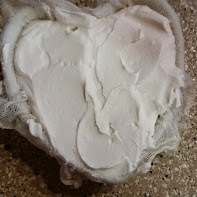 Fold the rest of the cheesecloth over the mold, and it’s ready for the fridge! Mascarpone is an Italian cream cheese, and doesn’t have as much tanginess as American cream cheese. I’ve seen this recipe with cream cheese, but I love how fresh it tastes using mascarpone instead. For my sauce, I used Chambord raspberry liqueur because it’s what I had. It’s pretty spendy, and you can get the same result with something less expensive. 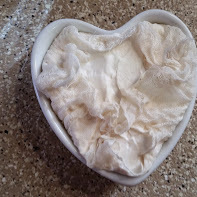 Cut four pieces of cheesecloth large enough to cover mold and to fold edges over. Dampen and lightly wring out, then line your four molds with the cheesecloth. In a large bowl, whip the mascarpone cheese, 1/4 cup heavy cream, vanilla, 1 Tablespoon lemon juice, and 1 Tablespoon raspberry liqueur until completely blended. Place bowl in the refrigerator. In another bowl, whip the remaining 1 cup heavy cream and sifted confectioner’s sugar until you can form stiff peaks. Fold this into your refrigerated cheese mixture until blended, working in batches if necessary. Spoon the mixture into your molds, and fold the edges of the cheesecloth over the mold. Place the molds on a rack set over a baking sheet. Refrigerate 6 hours or overnight. Place the raspberries in a bowl and sprinkle the sugar, remaining raspberry liqueur, and the last 1 teaspoon of fresh lemon juice over. Refrigerate until you’re ready to finish the Coeur a la Creme. I like to stir it every now and again, but it’s not a huge deal. When the raspberries are macerated, puree in a blender, reserving some whole berries for garnish if desired. Peel the cheesecloth back from the mold and drape over the sides. Invert each mold onto your plate and carefully unmold. Slowly remove the cheesecloth. 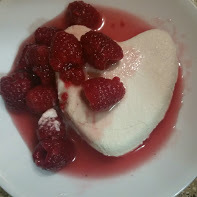 Spoon some sauce around each Coeur a la Creme, and garnish with some whole raspberries. and I'll never have that recipe again!